Rafting Trip Class III & IV or II & III. 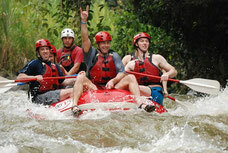 While you’re on your vacation in Costa Rica, specifically to the La Fortuna – Arenal Volcano area make sure to set aside a day to go rafting on class II & III or III & IV rapids. 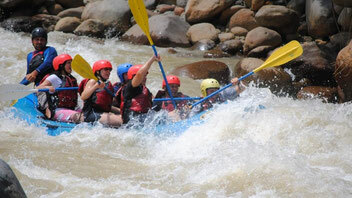 We offer this excursion to descend the rapids of the Balsa River, you choose if you prefer Class II & III (ideal for families with children or beginners to this kind of adventure) or Class III & IV (ideal for adventure lovers). The Balsa River offers a fun combination of white water thrills and areas where the water is docile enough to jump in and go for a swim. 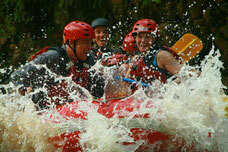 The adrenaline packed Rio Toro explodes with a series of over 45 continuous class 3-4 rapids. You’ll paddle 3 hours through unexplored, tropical wilderness in a deep canyon with waterfalls, exotic animals and tropical birds. 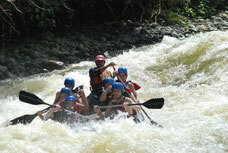 The premier river in costa rica for white water rafting. Pacuare is world famous for its sheer beauty. Here you enjoy the feeling of total isolation from urban life and the realness of being connected with nature. You see waterfalls cascade into the river from both sides as colorful, tropical birds fly right over your head. The Sarapiqui River is a perfect combination to enjoy the white water rafting with observation of the exuberant flora and fauna. 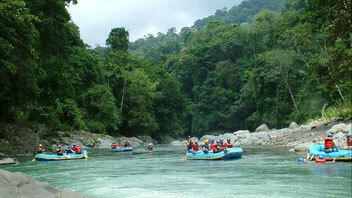 Sarapiqui offers many Class II and Class III rapids making it especially suitable for beginners, intermediate rafters and nature lovers.